No school feels quite like Temple. 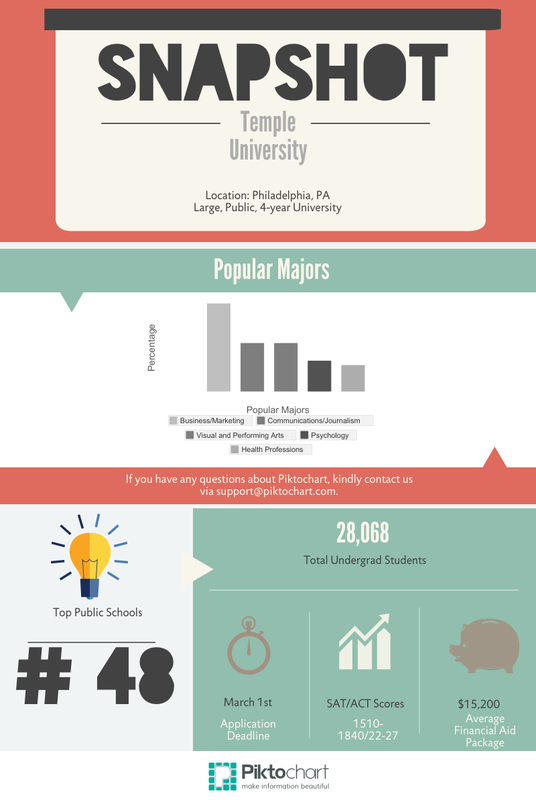 Experiencing the diverse student body set to the backdrop of Philadelphia is a unique feeling. Step out of your residence hall and stroll down the famous Liacouras Walk – it isn’t unusual to see students chatting in bright lawn chairs like something straight out a movie. In the warmer months students suntan on Beaury Beach, or “The Beach” as students like to call it, while a group of kids adjacent to them smoke hookah in the grass. If you venture to the outskirts of campus you see cars speeding down North Broad Street in the bustling City of Brotherly Love. Center City is just a short subway ride away and houses a second Temple campus. To love Temple you have to love Philadelphia. Students are seen jogging or biking into the city which is a short journey. Once in Center City, restaurants, bars, shopping and parks await. Temple students are smart in and out of the classroom. It is necessary to develop street smarts quickly; like how to navigate the subway system or how to interact with the homeless. The trendy outfits seen on campus reflect the urban setting, but of course for every stylish ensemble there is a Victoria’s Secret Pink hoodie with matching leggings. Open-minded attitudes combined with a real-world atmosphere makes any student at #TempleMade. How to Get In: The interesting thing about Temple University is that it continues to improve as time goes by. Each incoming class has more impressive statistics than the previous and it is climbing the college rankings each year. Temple wants students who show this type of growth and potential. Aside from showing a commitment to academics with at least a 3.0 GPA, Temple also wants students to truly show who they are and stand out through their personal essay. With the “Temple Option,” for students who don’t feel standardized test scores accurately captured their capability, standardized test scores not required. 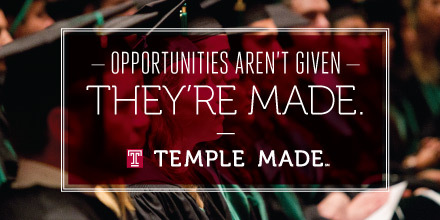 Temple wants students who are smart, have dreams and can prove to them that they have what it takes to be Temple Made. 1. The Temple mascot is an owl (Hooter), but the school also has a real owl, Stella who attends football games. 2. Temple does not have any official sorority houses because according to Pennsylvania law they would be considered brothels. 3. The newest residence hall, Morgan Hall, has a flat screen television in every apartment for students to use while they live there. 4. There is no shortage of food with food trucks located throughout campus with a variety of options from crepes to grilled cheese. 5. Temple used to be a night school, which is why the mascot is an owl. 6. Temple recently changed admittance requirements and does not require standardized tests from prospective students. 7. Every year the School of Media and Communication brings in a person in the media to speak including past people like Anderson Cooper, Brian Williams and Whoopi Goldberg. Tickets are free for students.